We got the call on Monday from our genetic counselor about our blood work. So thankful and relieved and happy to get this great news! On Friday, we met with Dr. W, our OB. We weren't originally scheduled to see her until September 14th, but I had called her asking for something to help me sleep and so she wanted to meet before that face to face. She seems very caring and wonderful so far. We were supposed to see her at 7:15 but we didn't get to an exam room until 7:45 so we were a bit stressed about that. From there we had to hurry over to the pediatric cardiologist. Luckily, even though we were running late, they told us when we arrived that Dr. R was also running late. Instead of seeing him at 8 like we had scheduled, we got back to see him around 8:45. It was the morning of late appointments! Just picture Mr. SPS and I being the only two people in the waiting room of a pediatric cardiologist for almost an hour, watching the Disney Channel since the whole office had a Disney theme and was geared towards kids. Don't we have to watch enough of that kind of television at home with E? It was kind of humorous. Then we were taken back into a room with an ultrasound tech and Dr. R. It was like a regular ultrasound except there was no screen for us to watch and the doctor and the tech sat together in front of their screen using technical terms we couldn't understand. They had told us we would meet to discuss the findings after, so I just started to relax since the lights were down and I stared at the Disney decals on the wall. At times, the pressure on my stomach really hurt because they had to push hard to see her heart at the right angles. After about 20 minutes, I looked over at Mr. SPS and he made a funny face at me. I started laughing and since the doctor had the ultrasound wand on my stomach, he turned away from the screen and said, "Are you alright?" Maybe he thought I was crying. Then when he looked at me he said, "Oh, is something funny?" I got a hold of myself and he put the wand back on my stomach. Then Mr. SPS said, "This is a really bad time to get the giggles." That made me start laughing all over again. The doctor sighed and took the wand off my stomach again to wait for me to stop. I wanted to say, "Oh, am I inconveniencing you? Because we had to wait 45 minutes for this appointment to start. And my emotions are all over the place the past 6 weeks so sorry if I lose myself for a minute laughing!" After the ultrasound, Dr. R sat down with us and discussed the results. They are pretty much the same as what Dr. B suspected. There is a hole between the lower chambers of her heart, called a ventricular septal defect (VSD). While this isn't affecting her in utero, it will be a problem when her heart takes over when she is born. The hole will disrupt the pressure that should be there in a beating heart. He said that this means she will have heart failure within the first few months of her life, if she makes it that far. He said she would start breathing faster when this happens. It is so hard to imagine watching that. We told him we didn't want to have surgery and he agreed that he didn't recommend that and it would be "a heroic measure" because of her other issues as well. If it were an isolated defect this would be a totally different story, but it is caused by her diagnosis. We basically wanted to see him so that Dr. L knew what to expect when treating her and now we know some medications she can have that will ease her discomfort. Lastly, we went to the non-medical ultrasound facility again so they could record her heartbeat and make a teddy bear for us. When we arrived, they said the didn't have any appointments booked at that time (they opened early for us) so not only could we get the heartbeat, but they would do another ultrasound for us, too! We weren't expecting this at all and since we didn't get to see her much at the echocardiogram, this was wonderful! She was hiding her face, all curled up like she was trying to sleep after all the poking at the cardiologist. We got to see her profile, her hand and her foot close up, and one time what looked like a smile. They gave us another DVD, CD with photos, and print outs. It was such a nice surprise! Since everything ran late, we got home later than we expected. Mr. SPS decided to stay home for the rest of the day since a morning full of appointments really takes a lot out of us. He is working from home as I type this to make up the hours. It was really helpful to have him here with me Friday afternoon so I didn't sink into too much of a bad place like I sometimes do when I'm alone. Even when we aren't discussing Violet and her situation, it is so comforting to have him near me because I know he understands and we are in this together. And there are also times when I just need him to take over caring for E because I just can't manage to do much after the whole day with her by myself in addition to my emotions. I feel bad about that because taking care of her is my "job" and what I love to do, but since she is almost two she can really be challenging on top of everything else! Wednesday we have an ultrasound with Dr. B and then we are meeting with the palliative care team. I am looking forward to this meeting because we are at a point now where we have lots of questions that only they can help us answer. Yesterday we had an ultrasound at Maternal Fetal Medicine. We had the tech who did Violet's measurements and then since Dr. B was busy we saw Dr. O. This ended up being a very good thing! Since we received the call about Violet's diagnosis from Dr. O and were less than pleased with the way some things were worded, we didn't expect this appointment to go as well as it did. Before he came in, Mr. SPS and I were discussing how hard it is to just choose comfort care and the guilt that comes with it for me. The always wondering if you should do more. When Dr. O came in I brought this up and he said some of the most comforting things that I just needed to hear. It is hard for me to remember all that he said and last night I asked Mr. SPS to remind me. He said that the best thing we can do for Violet is surround her with love and hold her for her WHOLE LIFE. He said that even if we are loved our whole lives, as we get older, there are times when we feel alone and doubt that love. Violet will never feel that. He said I am holding her now and will hold her and make her comfortable for as long as she is with us. He said he doesn't know what it is like to be in our shoes as a parent making these decisions, but as a doctor he would make the same ones. He feels that surgeries and intubation would prolong her dying and aren't worth the discomfort they will cause her even if they are "saving" her. Then we would also have to decide when to pull the supports and let her go anyway. Everything he said was what I felt in my heart, what I know to be true and right for all of us, but I just needed to hear it from someone else. The fact that it was a doctor made it even better. It is so hard to doubt your choices when your instinct as a parent to protect and save your baby is so STRONG. But we have to remember that by letting her go with grace and dignity, in our arms we are protecting her and saving her. We also discussed the many, many scenarios that her life may take and he reminded me to plan but to not get too overwhelmed about the choices until she is here. We discussed the parallels with making these choices for an elderly relative, but how unnatural and wrong it feels to be making them for your baby. It was just a good, therapeutic appointment in that way. Medically there is nothing really new with Violet. She is a bit small and everything else looks the same for now. Our next ultrasound is in five weeks. After that appointment we met with the chaplain. That meeting was comforting, as it always is to talk with her. We discussed some questions and concerns we had with her. I feel better knowing that we are on our way to completing our birth plan and making as many of the choices as we can now. Dr. L was not available by the time we got out of our ultrasound so late. But he got the cardiologist's report and we will meet with him next time. 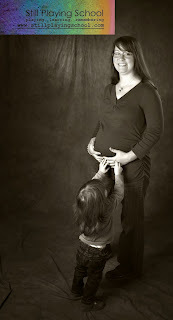 I have been emailing with the Now I Lay Me Down to Sleep photographer to plan some maternity photos as a family. It is very comforting to think about having those done. As everything gets closer, I am more emotional and stressed, but I still feel like we're doing well, mostly. I know that I still feel optimistic at times that I will feel more like myself once in awhile and that there might be a long while where I don't but it will return. I have all the love and support I need in every way.